the organization East West Centerpoint is a registered 510 (c) 3 tax-exempt non-profit, fiscally sponsored by Dancer's Group. and mirco-enterprising in the region. translation of a Uyghur dance history book, which is currently in need of sponsorship. Region. 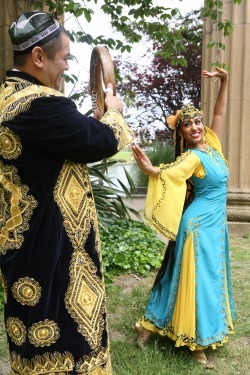 The ensemble is made up of master artists of the Central Asian diaspora lead by Doira virtouso Ostad Abbos Kosimov, Uzbek dance master Soghdiana Israilova, Tara Pandeya as well as esteemed core dancers and musicians of the dotar, robab, tambur, kanee, zur and qiroq.